Years ago, this used to be a nice town. Plenty of water, fertile ground, and the cattle could graze on the hills. 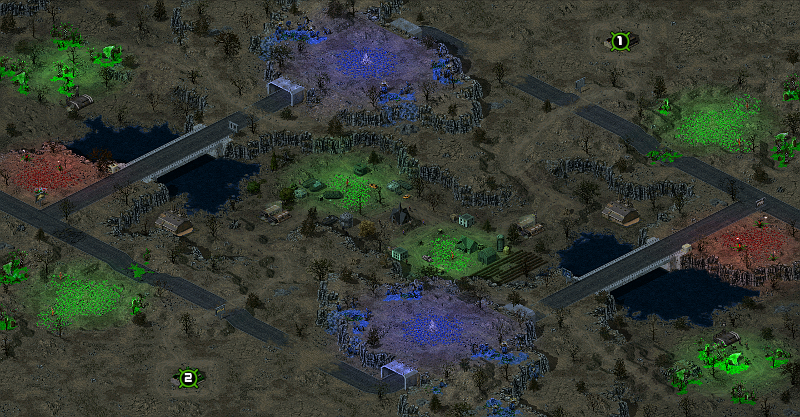 That was before the Tiberium came. The town and nearby forests were bathed in an eerie green glow, and the grazing hills now emitting a blue hue of Viniferum. Recently, a tribe of Forsaken came across the town. They settled here, erecting a base of operations. Then, one day, they mysteriously disappeared, never to return again. Since then, the canyon has been the stage for numerous battles, both to harvest the rich Tiberium in the area, and to claim the Forsaken outpost. Click here to see a making of -video. Such a purdy tourney map Mr.Train. "And Cain went out from the presence of The Lord, and dwelt in the Land of Nod, east of Eden."